And so it has come time again to pack up far too many accumulated clothes into those stupidly small backpacks and head to the airport! Just as we were starting to become pro beach bums and perfect our aussie accents, our time in Sydney was up. 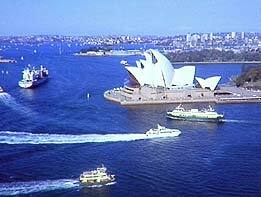 We lived in a luxury apartment in Darling Harbour for 3 months and another 6 weeks at the world famous Bondi beach sharing a house with 3 fellow brummie girls. Not a bad way to experience living abroad! While Laura has earned her living working in a trendy restaurant in Darling Harbour and Kate in a popular clothes shop in the shopping centre of the city, Phil has become a man of all trades after starting (and mainly getting fired from) a grand total of 8 jobs! Phil playing for the Wests waterpolo team, only taking a short 6 week break to let a broken hand heal (A note to all: no matter how soft a sofe looks it is not a good idea to punch it when drunk!) The season did result in his team getting a gold medal for winning the league, so i think they forgave him! Intensely following (and trying to learn about) every single ashes test on an outdoor screen in the Darling Harbour park. At least our suntans made it worth watching!Phil later went to watch the 1st one day international we won, finally putting them on a winning streak. Watching Robbie Williams live at the football stadium. Kate and Adam doing the Sydney bridge climb hot on the tail of a major thunder storm. Laura and Phil working behind the bar of the biggest music festival in Sydney and successfully aiding 36,000 peoples drunkeness! Pretending to be posh for a night with the Gallops and watching an xmas concert at the Opera House. Spending Xmas in Surfers Paradise with a bbq'd xmas dinner!Laura and Kate attempted surfing lessons only to really learn that standing on the board is near inpossible and they should def stick to swimming! Road tripping to Palm beach, more commonly known as Summer Bay! In our search for Alf's surf shack we managed to find a film crew, cast members and summer bay life saving club. We did consider making our acting debuts but Home and Away didnt share the same vision! Fortunately we all made brilliant skipperss and hired our own boat (well tin can with a motor) for the day and cruised the area stopping for a picnic on our own private beach. Being paid to star in a Nikon camera advert after being spotted looking 'athletic' running on bondi beach. Obviously we must have looked more like glamorous baywatch babes and less sweaty and out of breath from a distance! Walking over the pedestrianised harbour bridge with 30,000 othee people to celebrate its 75th anniversary. Getting into the aussie sproting spirit and watching a professional rugby league game. Our image of aussie rugby invloving driking beer in the sun couldnt have been more wrong as we watched it huddled under umberellas. It seems rugby is such a universal sport it even has the same weather conditions! Welcoming in the new year with a small intimate party of 30,000 others at the Opera House to watch the harbour bridge fire works. Even after a wait of 8 hours just to get a spot they were still amazing! Witnessing the 2 largest cruise ships in the world dock in the harbour at the same time., again attracting 1000's for the event. The QM 2 on its maiden voige around the world was honestly bigger than all of the buildings surrounding it on dry land! Watching the USA tennis open final on a big screen outside the Opera House with 5,000 other people. Taking 2 days out to bush walk, mountain bike and ride on the steepest railway int the world at the scenic Blue Mountains. We managed to survive all the treks, only stopping to scream a few times from encounters with a snake, leach and far to many spiders! Sydney is definately our favorite city so far and we all agree we could stay there for a lot longer than 4 1/2 months. We'l definately miss the amazing firework displays Sydney have for every occasion possible from Mardi Gras to Australia Day( they know how to keep the tourists happy! ), and our ritual sunday nigth BBQ's on the beach! Were sure Melbourne wont disapoint though as were off to live in a swimming and waterpolo heaven for the next 2 weeks!